The basic setup of ‘Skylanders SWAP Force” is the same as the previous two games. The player uses physical figurine, puts them on a portal of power and then the character comes to life on the screen. There are 16 new characters that can be pulled apart and rebuilt into new combinations. There are a total of 256 different combinations with the new SWAP Force characters. The old figurines from the previous two games will also work with the new game. However, the old portal of power will not work with SWAP Force. The makers of the game state that the new figurines required a different technology, making a new portal design necessary. The only option is to buy a complete starter pack that is around $75 and comes with the game, portal of power, and three figurines. Individual SWAP Force characters cost around $15, Core and Lightcore Sklyanders cost around $10. The game is still set in Skylands, but in a different area called Cloudbreak Islands. Kaos is the villain of the game once again and he is joined by new villains and enemies. The premise of the games is that there is a volcano that erupts to replenish the magic in Skylands once every 100 years. The SWAP Force Skylanders were caught in an eruption of the volcano, which gave them the magic ability to swap halves and combine powers. 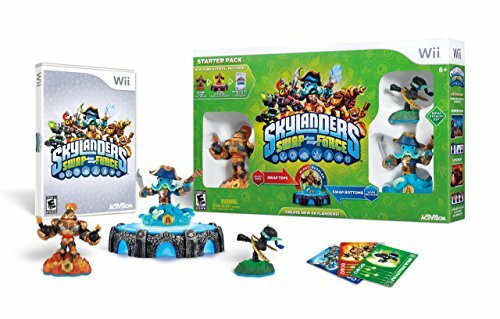 The goal of the game is to save Skylands from Kaos once again. Along with the 16 new SWAP Force characters, there are also 16 new Core and 8 new Lightcore Skylanders. In addition, there are new versions of 16 Skylanders from previous games that have new features. The game includes new gameplay modes of solo survival mode, team survival mode, rival mode, battle arena mode and ring out mode. For the Skylanders fan and player, this game is not likely to disappoint. It has many new features and adventures to offer. The major negative of this game is the same for the previous versions-cost! The starter pack is just the beginning of the cost because the avid player will likely want to collect all the figurines. The wide range of new characters and gameplay are sure to keep players entertained. It has been one year since the release of ‘Skylanders Giants,’ and throughout the year, new giant figurines were released in four waves. I expected to see new figurines released as we enter the Christmas season, but I was surprised to learn that a whole new game is coming. It is no doubt Activision’s response to the new game by Disney called Infinity. There will be quite a battle between the two games this shopping season, and I am curious to see which one comes out on top.